Hello, my name is Line Gammeli. I’m 20 years old and live in Sweden. This summer I’m planning a bike tour from a small village north of Nora to Trondheim in Norway by myself. I have never done something like this, but I have always wanted to do something like it! Thanks to your videos I learned that bike touring was a thing and I got motivated to do it myself. I am so excited for my tour. I’m looking forward to every bit of it – both the good and bad moments, because I know that when I’m done with the tour I will have great memories to look back at, and experience for other trips. I want to do my trip because it’s a challenge and because I love the outdoors and to experience new things. Why I want to do my first bike tour by myself is because I want it to be more exciting. If I were to travel with a friend I would feel more comfortable and safe. That would, of course, be nice on the first trip, but I still don’t want that. I want to experience as much as possible. I’m planning on taking a route Google Maps recommended for bicycles. It looks pretty good, the roads are small so there won’t be too much traffic. Some of the roads will be dirt roads, but I think they will be fine to bike on. Otherwise I might find a better road to follow. When it comes to food, I’m planning on bringing some light food and then stopping at supermarkets I’ll pass. There doesn’t seem to be many of these, but I think there will be just enough. I’ll camp in the forest. I’d like to camp pretty close to humans, but not too close. So, maybe some hundred meters outside of a small village. Thanks again for inspiring me and others to do this. After receiving this message from Line, I kept in touch with her and soon thereafter learned that she did in fact attempt her solo bike tour from Nora to Trondheim, Norway. Sadly, her bike tour was not a complete success and she ended up going home after just two days on the road. Like so many first-time bicycle tourists, Line made a number of small mistakes, which ultimately caused her to quit her bike tour prematurely, turn around and go home. She started her first day of cycling too late in the afternoon. She didn’t eat enough each day as she was riding. She planned on cycling too far each day. She did not practice setting up her tent before leaving home. And she wasn’t prepared for what it was going to be like to be alone in the wild and far away from all of the people and places she was familiar with. Most people who quit a bicycle tour usually do so during the first one or two days of their trip. And they usually quit for one or more of the reasons Line prematurely canceled her bike tour. But a failed first bike tour doesn’t mean you should give up on your dreams of traveling by bike. Many of the people who quit their first bike tour during the first day or two end up going home, resting up, reassessing their tactics, and then try bicycle touring again at some point in the future. 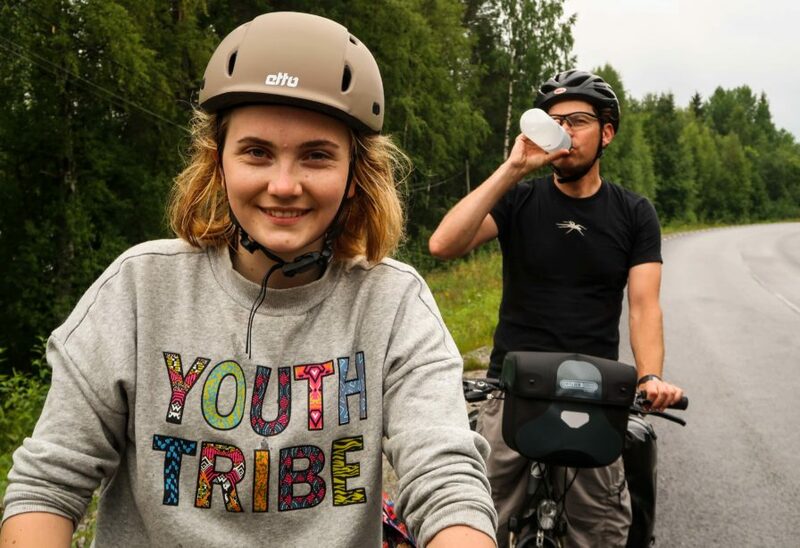 I wanted Line’s bicycle touring story to be a successful one, so I invited her to join me and two of my friends on a self-supported bike tour in northern Sweden. 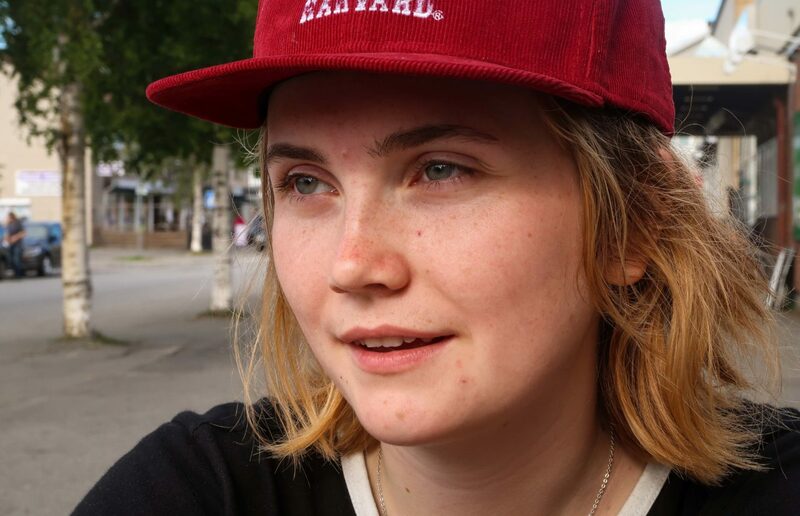 I told Line that if she could meet me in Umea, Sweden on the morning of August 5th, 2017, she was welcome to cycle with me and my friends for the next week as we conducted our own 300 kilometer bike tour up the northeastern coast of Sweden. A couple months later, Line Gammelli traveled to Umea, Sweden on a series of buses and trains and arrived at my apartment in the city center – tired, but rearing to go! What followed was one week of epic bicycle touring adventures. Line Gammelli started off slow. She wasn’t quite sure how to change gears on the bike she was borrowing. She still wasn’t very practiced at setting up her tent. But after a few days on the road, she became a Bicycle Touring Pro! She was strong on the bike, confident interacting with the locals, and was a joy to have as a bicycle touring partner. Click here to view the photos from Line’s 300 km bike tour up the northern coast of Sweden. Then click here to listen to Line Gammelli discuss the lessons she learned from her first two bike tours. 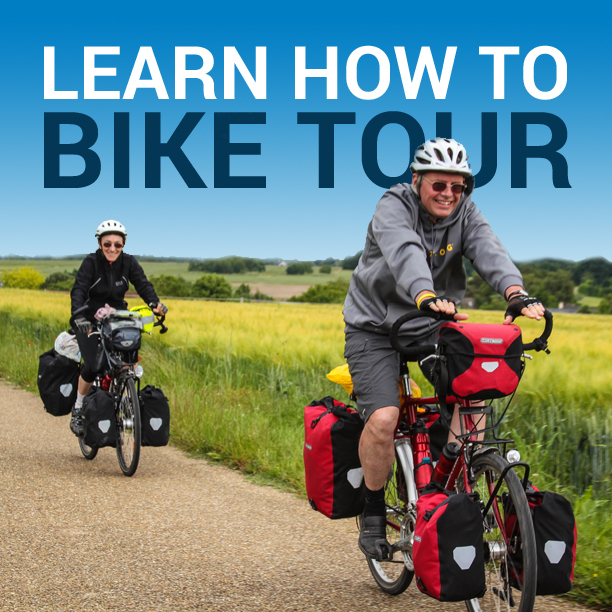 If you are new to bicycle touring, this is an interview I think you will find both educational and inspiring. This entry was posted in Bicycle Touring Pro Articles, Featured Articles, Featured How-To Articles, Main Articles, Main Featured Articles, Podcast, Sweden, Uncategorized and tagged bicycle touring, bicycle touring pro podcast, bicycle touring virgin, cycle touring virgin, first bicycle tour, first bike tour, group bicycle tour, lessons, lessons learned, Line Gammelli, northern sweden, podcast, sweden, sweden bike tour, things i learned. Great recap and interview with Line. I am not a strong rider, but even I am inspired to get on my bike and give it a go to one of my local parks. A weekend trek would be a great way to get my feet wet! Thank you for all the information that you share. I was just in Trondheim in August and now I want to go back and hike from Oppdal. Such a beautiful area!